The Energy Master Plan is a framework programme, meant to result in a long term agreement upon the exploitation and protection of Iceland’s glacial rivers and geothermal areas. Its making, which since 1999 has been in the hands of special steering committiees, established by the two above-mentioned ministries, reached a critical status in July this year when its second phase was finished and presented to the ministers who in mid August presented their proposition for a parliamentary resolution. Before it will be discussed in parliament the proposition will be open to comments and criticism from the public, as well as interested parties, energy and aluminium companies on the one hand, environmentalists on the other. The proposition lists natural areas into three categories; protection, exploitation and hold. The last-mentioned includes areas that, according to the steering groups and ministers, have not undergone enough research for a decision to be made upon weather to protect or exploit them. Included in this category are, among other, the glacial rivers in fjord Skagafjörður as well as other rivers such as Skjálfandafljót, Hvítá, Hólmsá and Farið by lake Hagavatn in the south-west highlands. Also geothermal areas such as Trölladyngja and Austurengjar in Krýsuvík and certain areas around mount Hengill where the heavily indebted Reykjavík Energy (OR) already operates Hellisheiðarvirkjun, a sulphur polluting geothermal power plant. The 27 areas of the waiting category will be revised in five years, given that satisfactory studies have been made at that time. Delightfully, the protection category features the uppermost part of river Þjórsá where Landsvirkjun wants to construct Norðlingaölduveita, a dam that would destroy the Ramsar listed Þjórsárver wetlands. River Jökulsá á Fjöllum, which has been seen as an energy potential for a new Alcoa aluminium smelter in Bakki, is also listed protected. The same applies for certain parts of river Tungná, in which Landsvirkjun is already building the Búðarháls dam that will provide energy for increased production in Rio Tinto Alcan’s aluminium smelter in Straumsvík. 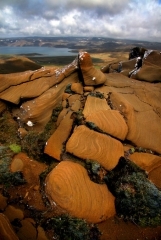 The protection category also features geothermal areas such as the ones around Brennisteinsfjöll mountains on the Reykjanes peninsula, as well as Gjástykki, close to volcano Krafla and lake Mývatn. The same goes for the Grændalur valley and Bitra, which are located close to the small town of Hveragerði and have been particularily desirable in the eyes of energy companies. Bitra was saved by a local campaign in 2008 whereas Grændalur was recently threatened when Iceland’s National Energy Authority allowed a company called RARIK to operate test drilling in the valley, in complete contravention of previous rulings by the Ministries of Industry and of Environment. The exploitation list features geothermal areas Þeystareykir, Bjarnarflag and Krafla in the north of Iceland, as well as Hágöngur in the mid-highlands west to glacier Vatnajökull. Also certain parts of the area around mount Hengill and finally geothermal spots in Reykjanes, Krýsuvík and Svartsengi, all three on the Reykjanes peninsula. Rivers Hvalá, Blanda and Köldukvísl are then all categorised as exploitable. And most critically the Energy Master Plan proposition allows for Landsvirkjun’s construction of three dams in the lower part of river Þjórsá. The most common response from environmentalist so far has been threefold. Firstly there generally satisfied by the protection of areas such as the Gjástykki, Jökulsá á Fjöllum and Grændalur, let alone the Þjórsárver wetlands. Shortly after the publication’s release, Iceland Nature Conservation Association (INCA) stated that, if approved by parliament, the Master Plan will mark the end of environmentalists’ forty years long struggle to save Þjórsárver from destruction. 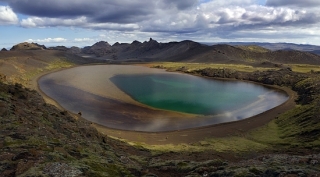 Though listed by the international Ramsar Convention on Wetlands due to its unique ecosystem, the wetlands have been on Landsvirkjun’s drawing table as a potential for construct a large reservoir, meant to produce energy for a planned expansion of Rio Tinto Alcan’s aluminium smelter in Hafnarfjörður, which was later thrown off in a local referendum. The plan has always been met with fierce opposition, no matter of Landsvirkjun’s repeated attempts to get it through by proposing a smaller dam and reservoir. Secondly environmentalists are critical of the fact how many invaluable areas, such river Skjálfandafljót, are kept on hold instead of simply been categorised protected. Thirdly there is a clear opposition to the planned exploitation of certain wonders of nature, one example being the geothermal areas on the Reykjanes peninsula. Ellert Grétarsson, a photographer who has documented these areas extensively (his photos are here aside), fears that the drilling in Krýsuvík – covering between five and eight thousand square meters of land – will simply kill the area. And as a matter, says Ellert, the whole Reykjanes peninsula will be riddled with energy construction. Hjörleifur Guttormsson, former Left Green MP and a genuine environmentalists, shares Ellert’s worries and has asked for an integral study of Reykjanes before any decisions are made. As as mentioned before the biggest concern regards Þjórsá, which has for a long time been the bone of contention between the two clashing arrays fighting for or against nature conservation. The struggle over Þjórsá has been especially tough, actually to such an extent that the government can be reputed to stand or fall with that conflict in particular. Guðfríður Lilja Grétarsdóttir, MP for the Left Greens, demonstrated, during parliamentary debate last April, her full opposition to the construction of dams in Þjórsá. At that point, three Left Green MPs, who up until then had been increasingly critical of the government and its lack of left-leaning policies, had just recently departed from the party, leaving the government with only one person’s majority in parliament. And as most members of the social-democratic People’s Alliance (Samfylkingin), which makes up the government along with the Left Greens, have not shown a sign of objection to the damming of Þjórsá, it wouldn’t be surprising if the river will be up for a heavy debate in parliament. In fact it is more than sure that Þjórsá will be among the main matters of argument in parliament. The right wing Independence Party, which was in in power from and is largely responsible for the neo-liberalisation and heavy-industrialisation of Iceland, has always been one of the driving motors behind Landsvirkjun’s plans to dam Þjórsá. When the Master Plan’s proposition was presented in August, Ragnheiður Elín Árnadóttir, a MP of the party, called for the immediate starting of construction in Þjórsá. She also said she grieved the long period of which the project has been stuck within bureaucracy, referring to the attempts of Svandís Svavarsdóttir, current Minister of Environment, to halt the construction of one of the three proposed dams by refusing to include the dam, Urriðafossvirkjun, in a land-use plans for the parishes of Flóahreppur and Skeiða- and Gnúpverjahreppur (rural districts along Þjórsá) made by them at the request of Landsvirkjun. The conflict in parliament mirrors the actual conflict in the Þjórsá region where locals have for a long time fought over the river’s fate. There Landsvirkjun hasn’t only used bribes in its attempt to get its plans through local administration, but also threatened farmers whose lands are at stake will the dams be built, by stating that if the farmers do not negotiate with the Landsvirkjun, the company will attempt for a land expropriation. This conduct has created a complete split within the local community, clearly demonstrated in last March when young locals from the region published a statement, in which they demanded a permanent halt to all plans of damming Þjórsá – thereby an end to the social conflict associated. As a matter of fact two members of the Master Plan’s steering committee recently stated, when interviewed on state radio station RÚV, that due to the serious lack of studies regarding the social impacts of the planned Þjórsá dams, those plans should without any doubt have been put on hold. This is exactly what Guðmundur Hörður Guðmundsson, chairman of environmentalist organization Landvernd, said in last July following the publication of the Energy Master Plan’s second phase report. Þjórsá’s position in the Master Plan proposition, yet shouldn’t be of any surprise. In the second phase report the three planned dams are not considered to be a great threat to the ecology of Þjórsá and its surroundings – contrary to the opinion of environmentalists who have voiced their worries concerning the dams’ impacts, for instance on the river’s salmon stock. Orri Vigfússon, chairman of the North Atlantic Salmon Fund (NASF), recently stated that “never before in the history of Iceland has there occurred such an attack on a sensitive area of wild salmon.” As is considered that the salmon’s spawning and breeding grounds are mosty located above waterfall Urriðafoss, where one of the three dams is planned to be built, Orri believes that the stock of salmon and salmon trout are likely to vanish. As one could have imagined, Icelandic energy companies and other adherents of large-scale power production for heavy industry, are everything else than happy about the Master Plan’s proposition. Following its release Eiríkur Hjálmarsson, Public Relation manager of Reykjavík Energy, opposed the protection of Bitra on the ground that the company has already harmed the area with three examination boreholes, roads and electricity lines – but most importantly, spent 785 million ISK on the project. As reported earlier this year by Anna Andersen, journalist at the Reykjavík Grapevine, the foolhardy business operations of Reykavík Energy during the last decade or so – including large-scale geothermal projects associated with heavy industry – have brought the publicly owned company a debt of 233 billion ISK (2 billion USD or 1.4 billion Euros). Despite this financial collapse the company still advocates for the continuation of the agenda that brought it down. Other energy companies have responded similarly, mostly complaining about the amount of areas listed as protected or on hold. Landsvikjun’s director Hörður Árnason has said that compared to the second phase report, the parliament proposition suggest that way too many energy options are put on hold. Another company, Suðurorka, owned by Alterra Power (former Magma Energy) and Íslensk Orkuvirkjun, had planned to construct a dam, called Búlandsvirkjun, in river Skaftá – a plan that the proposition puts on hold. The company argues that few energy options have been studied as thoroughly and while the studies might have been done – and might be thorough – not everybody agrees with the company on the impacts. Farmers in the area have opposed the project as some of their most important grasslands will be drowned under the dam’s reservoir. Energy company RARIK will, due to the Master Plan, loose its grip on geothermal areas in Grændalur valley, as well as rivers in Skagafjörður and Hólmsá river – projects that the company claims to have invested in with 300 million ISK. Using the same monetary argument, HS Orka, also owned by Alterra Power, has been vocal about its 700 million ISK investment into their proposed, but now delayed if not entirely halted, geothermal plants in Trölladyngja. Finally representatives from Reykjahlíð, a small town that holds the good part of Gjástykki’s property rights, have stated that if the area will be protected, billions of ISK will be demanded as compensation. Those arguments do in fact manifest the predominant strategy of those involved in the heavy industrialization of Iceland. Instead of waiting for all necessary contracts to been signed, all needed permissions to be granted, and all required energy to be ensured, the energy and aluminium companies have simply started major construction immediately when only one or a few permissions have been granted. And when criticised, not to mention when forced to stop, they have stated that because these projects have been announced and vast amounts of money put into them, they should be allowed to continue. If needed, they have also pointed out that because the natural areas at stake have already been harmed (by themselves), there is “no point” in preserving them. One example would be Helguvík, where a framework for a proposed Century Aluminum smelter has already been built but hardly any construction has taken place there for two year. With every day that passes it becomes clear that not only has the company failed to ensure the energy needed to operate the smelter, but also that the energy simply doesn’t exist. Geologist Sigmundur Einarsson has, for the last years, pointed this out and stated that the amount of energy needed for the Helguvík smelter cannot be found and harnessed on Reykjanes, like stated by the parties involved. For instance he believes that no more than 120 MWe can be harnessed in Krýsuvík, contrary to the official numbers of 480 MWe, and has repeatedly demanded answers from the authorities about where from the rest of the energy is supposed to come. Just as Saving Iceland’s questions about the whereabouts of energy for Alcoa’s planned smelter in Bakki, Sigmundur’s questions have never been answered, but he claims the Energy Master Plan proofs his theory. Yet Another Three Kárahnjúkar Dams! The increase of public electricity usage is about 50 gigawatt-hours per year. The expansion entailed in the proposition would thus sustain that particular public increase for the next 265 years! If this will be the conclusion, the energy companies can be very satisfied. Still they send their agents onto the media, in order to cry and complain. That doesn’t give a good hint for a settlement. Other environmentalists, Ómar Ragnarsson for instance, have mentioned that the whole discourse surrounding the Energy Master Plan portrays a false image. While the plan regards Iceland’s each and every hydro and geothermal area, potential for exploitation, the areas that have already been harnessed are kept outside of the discourse. Ómar says that it is simply false to state that “only twenty-two areas” have been categorised exploitable, as twenty-eight large power plants have already been built in Iceland. That means that out of the ninety-seven considered in the Master Plan, fifty have already been or will be utilised. In addition to the twenty-seven areas put on hold, another thirty-two have yet not been categorised by the steering committees, which makes the current proportion of protected areas even lower. Ómar has also pointed out mismatches within the proposition. 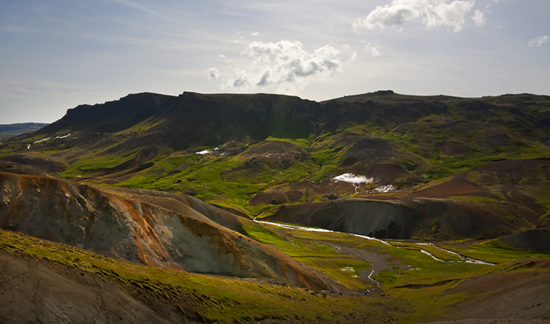 One example regards geothermal area Gjástykki that is listed as protected, as it is “a part of Krafla’s volcanic system, which has a protection value on a worldwide scale,” like stated in the proposition. But according to Ómar this will depend entirely on definitions. As an energy option, Vítismór, which is a part of Krafla’s volcanic system and is an inseparable part of the Gjástykki-Leirhnjúkur area, is currently listed as an addition to the Krafla power plant and would thus, regardless of its position within the Master Plan, be available for exploitation. Limnology (or freshwater science) professor Gísli Már Gíslason upholds Ómar’s argument and has stated that half of Iceland’s “profitable hydro power” has already been utilised. One of those rivers is Jökulsá á Dal, harmed by the infamous Kárahnjúkar dam, which in order to be built required disallowing the protection of Kringilsárrani, an extremely important grassland for reindeer. This is not a unique incident as, for instance, the three dams in river Láxá are also manifestations of hydro power plants built in protected areas. Notably by the above-listed contradictions, which though demonstrate only a small part of the debate about the Energy Master Plan so far, the coming struggle about the fate of Iceland’s nature is going to be harsh and heavy. Armed with the rhetoric of economic crisis, unemployment etc., those in favour of heavy industry – in other words a big part of parliament, the energy companies, the Associations of Industry and Employers, the country’s biggest trade unions, and most recently Samál, a joint association of aluminium producers in Iceland – use literally every opportunity to push for the further development of industry, especially aluminium. In order for that development to occur, the country’s glacial rivers and geothermal areas have to be exploited on a mass scale. Environmentalists, on the other hand, need to sharpen their knives and both ask and answer a great amount of questions. What, if any, are the actual benefits of heavy industry and its parallel large-scale energy production? And what are its impacts on Iceland’s society and ecosystems? No less importantly, what are its global impacts such as on the atmosphere or bauxite communities in India, Guinea, Hungary and Jamaica? How has it affected the economy and what are its contributions to the current economic situation? What are the impacts of the building of big dams and geothermal power-plants, fuelled by extremely high loans, bringing a temporary pump into the economy that inevitably leads to the demand for another shot? And what is the value of nature per se? Only by answering all of these and many more questions, one can honestly try to answer the one fundamental question regarding the Energy Master Plan: What actual need is there for yet another three Kárahnjúkar dams, or in fact just a single more power plant?